1) "McCain's friends and advisors were stunned" by Bush's failure to kowtow to McCain, NBC's Tom Brokaw intoned in embracing the loser's spin. David Gregory asserted that "it's the tone of Bush's interview, considered by some dismissive of McCain...that set off a firestorm." But few care about campaign finance reform. 2) Though she didn't utter the name Charles LaBella, NBC's Lisa Myers used his memo as the peg for a full NBC Nightly News story on his charge that the Justice Department went easy on Gore and to recount Gore's changing story on what he did when. 3) Media Reality Check: "Media to LaPierre: Only Conservatism Kills. Same Outlets Shocked by NRA Leader's Clinton Quotes Routinely Let Liberals Find Malice on the Right." 4) Playing John Madden as he used a football field tele-strator, on MSNBC, Jonathan Alter maintained Gore "doesn't have to turn that far toward the center" but "Bush has a bigger problem. He had to run way to the right, almost out of bounds in South Carolina." 5) A new book by two left-wing journalists, The Hunting of the President: The 10 Year Campaign to Destroy Bill and Hillary Clinton, had Geraldo ranting about the mainstream media's complicity in the right-wing conspiracy to destroy the Clintons. George Bush beat John McCain soundly in the primaries, but Bush's failure to adopt McCain's losing issues and show a media-like level of admiration for McCain angered NBC News. "John McCain's friends and advisors were stunned this morning when they read a lengthy interview in the New York Times with George W. Bush," NBC Nightly News anchor Tom Brokaw intoned Thursday night. Brokaw grouched: "The Texas Governor was not exactly conciliatory." Reporter David Gregory asserted that "it's the tone of Bush's interview, considered by some dismissive of McCain, even arrogant, that set off a firestorm." Gregory also highlighted the charge that Bush rewarded donors with overnights at the Governor's Mansion. The ABC, CBS and NBC evening shows led Thursday night with the surge in the Dow with ABC touching politics only in an "It's Your Money" segment on how Speaker Hastert diverted more Medicare money to a hospital in his district. The CBS Evening News also avoided the campaign but did run a 20-second item on the independent counsel's report on Filegate while NBC allocated 18 seconds to making what I believe was the first broadcast evening show mention of an effort in Arkansas to disbar Bill Clinton. "One of the investigations of the Clinton administration officially ended today with no charges filed. Independent Counsel Robert Ray, who last year replaced Kenneth Starr, reported finding quote, 'no credible evidence' that Hillary Clinton or senior White House aides were involved in illegally seeking FBI background files on Republicans." "President Clinton is a lawyer and a member of the Bar and he's now the target of a move in his home state to have him disbarred. Today he asked Arkansas officials to delay a decision until after he leaves office. An Arkansas lawyer's group wants his law license revoked for giving false testimony in the Monica Lewinsky case." Next, Brokaw discovered controversy in Bush's interview with the New York Times as he let "John McCain's friends" set the news agenda for NBC: "On the presidential campaign trail, John McCain's friends and advisors were stunned this morning when they read a lengthy interview in the New York Times with George W. Bush, the man who beat McCain for the nomination. The Texas Governor was not exactly conciliatory." In a piece which also ran on MSNBC's The News with Brian Williams, reporter David Gregory asserted: "Worried that his latest comments about Senator McCain will set back any chance of the Arizona Senator endorsing him, Governor Bush, on a fundraising trip in Illinois today, reaches out to his former rival." Bush: "I look forward to working with Senator McCain, as I said in my speech, he, he ran a good campaign. He brought to forth some issues that are important." "The Texas Governor backing away from an interview published today in which he makes no concessions to McCain on the Senator's central issue, campaign finance reform, saying, quote, 'He didn't change my views.' But it's the tone of Bush's interview, considered by some dismissive of McCain, even arrogant, that set off a firestorm. McCain is on vacation, but his top advisors are so angry they say privately Bush has for now spoiled any chance of an endorsement. The relationship between the two has been severely strained for weeks, and while Bush advisors point to another published interview today in which the Governor says he wants to, quote, 'make amends with John,' and, 'work together for reforms,' privately Bush advisors say the voters have spoken, and negotiation with McCain is unnecessary. But none of this has stopped Bush from using campaign finance reform against Al Gore." Bush: "He has no credibility on the issue. He must think America has amnesia. This is a man who went to a Buddhist temple to raise money." Trying to equate Bush with Clinton, Gregory argued: "But is Bush vulnerable on campaign finance? His staff has released a list of guests who slept over at the Governor's Mansion during the last five years. A government watchdog group now questions the more than $2 million donated or raised by Bush's guests." As names scrolled on screen Gregory continued: "The campaign insists Bush's visitors were friends or relatives, and the sleep overs were not linked to fundraising. With or without the support of Senator McCain, Bush advisors say they're happy to publicly debate campaign finance reform, believing it's the Vice President who's most vulnerable on the issue come November." "Reminded that Mr. McCain helped propel record turnouts in the primaries, Mr. Bush responded curtly, 'Well, then, how come he didn't win?' The governor noted that in South Carolina his candidacy helped draw record numbers of Republicans to the polls. "Mr. Bush's comments were notable because they suggested that despite the bruising, bitter and sometimes humbling nature of his primary campaign against Mr. McCain, the governor emerged without any regrets about his campaign's conduct, any second thoughts about his strategy or any new resolves for the way he positions himself for the general election. His confidence, if anything, seemed fortified." So just how many McCain supporters is Bush really alienating by not adopting McCain's liberal anti-free speech campaign finance "reform" plan? Not many. Just one in six McCain voters called campaign finance the most important issue, ABC News polling analyst Gary Langer showed in a story posted on the ABC News Web page. He also documented how far from media hype for the "millions" McCain drove to the polls, he actually only generated fewer than one million new voters. Here's an excerpt from Langer's March 14 piece titled, "The Myth of Footprints. McCain's New 'Millions': Time for a Recount." It has become fashionable to report that Sen. John McCain bought "millions of new voters" to the polls this primary season, that many of his supporters just might jump to Al Gore this fall, and that McCain's millions are on fire for campaign finance reform. First, the new voters: In the Super Tuesday exit polls, 20 percent said it was their first time voting in a Republican primary....Fifty-five percent of those voters went for McCain. These are the new voters McCain brought in: Fifty-five percent of 20 percent of all GOP voters. ABCNEWS estimates that 12,453,466 warm bodies voted in Republican nominating events -- primaries and caucuses alike -- through last Friday....Twenty percent of all GOP voters as new voters -- that's 2.49 million souls. And new McCain voters were 55 percent of that -- 1.37 million. Finally, campaign finance reform. Was it the burning issue behind McCain's support? Apparently not. Among all McCain voters on Super Tuesday, 16 percent cited campaign finance reform as the most important issue in their vote -- tying it for second place, behind "moral values" and even with Social Security/Medicare. Look at it this way: Just one in six of McCain's own voters said campaign finance reform was their main motivating issue. Eighty-four percent picked something else. Langer is the Director of the ABC News polling unit, but MRC analyst Jessica Anderson informed me this analysis hasn't made it yet onto World News Tonight, GMA or Nightline. Thursday night NBC became the first broadcast network, on a weekday edition of its evening show, to quote the charges made by Charles LaBella which the Los Angeles Times revealed last Friday in a front page story on his long-suppressed memo about Clinton-Gore fundraising. The intrepid Lisa Myers provided a nearly three-minute-long piece on Gore's fundraising history in which she also noted Maria Hsia's conviction, a March 2 verdict NBC Nightly News skipped at the time. As noted in previous CyberAlerts, last Friday, March 10, the memo's unveiling was highlighted by CNN and FNC but ignored by ABC, CBS and NBC. ABC News has yet to acknowledge it, though its play on the front page of the Saturday, March 11 New York Times generated a story on that night's CBS Evening News, a broadcast bumped by basketball off most ET and CT affiliates. The morning shows have yet to mention LaBella's name. "Under fire from Republicans, the Attorney General today denies she gave Al Gore special treatment when she repeatedly refused to launch an independent investigation into whether Gore lied about campaign fundraising abuses." "But Reno's former top prosecutor charges that a memo recently leaked to reporters that Gore 'may have made false statements,' and that Justice officials did legal 'contortions' to avoid a full investigation. Issue #1: Did Gore tell the truth about some 70 phone calls he made from his office to generate millions for TV ads." "First Gore insists he wasn't raising so-called hard money regulated by election laws. Later he says he didn't know he was raising that kind of money. Then documents surface showing Gore attended a meeting that should have alerted him hard money was involved. One participant claims Gore was, quote, 'attentively listening.' Yet in an interview with the FBI, Gore still insists he doesn't remember, saying he doesn't recall more than twenty times. Gore does remember, quote, 'he drank a lot of tea during meetings, which could have necessitated a restroom break.'" Charles Lewis, Center for Public Integrity: "The Vice President seems to have a problem telling the truth. I mean, you can't listen to some of the stuff and not chuckle to yourself, 'I can't believe he's just said that.'" Myers moved on: "Issue #2: Gore's notorious visit to that Buddhist temple in April 1996. Gore insists he didn't know it was a fundraiser. First he says he thought it was community outreach, later that it was finance-related, then this:"
Gore, from January 25, 1997: "Well, it was a mistake. I did not know that it was a fundraiser, but I knew it was a political event, and I knew that there were finance people who were going to be present." Myers countered: "Yet documents from the Secret Service, Gore's staff, even one of the Vice President's own e-mails, all refer to the temple stop as, quote, a 'fundraiser.' Recently, long-time Gore fundraiser Maria Hsia was found guilty of illegally laundering at least $55,000 in campaign money through those monks and nuns." "Even as Gore admits mistakes and tries to turn a liability into a virtue, he refuses to urge the Justice Department to release documents and photos that might shed light on what he knew and when. Veteran Democrats worry this will dog Gore through November." -- The power duo of me and the Wall Street Journal? The March 15 Journal carried an op-ed piece by me documenting how the broadcast networks skipped the LaBella memo last week. The day after the column appeared NBC produced a story pegged to LaBella's memo. Coincidence? Reporters are condemning the NRA's Wayne LaPierre and Charlton Heston for the tone and substance of their attacks on Bill Clinton, but many reporters haven't hesitated in the past to hold conservatives accountable for bloodshed. Last year after the Columbine tragedy Time's Margaret Carlson asserted that those who oppose gun control consider "schoolyard massacres an acceptable cost for its right to be armed to the teeth." Following the Oklahoma City bombing another Time reporter held culpable conservatives who advocated government budget cuts: "The inflamed rhetoric of the '90s is suddenly an unindicted co-conspirator in the blast." Charles Gibson warned on Wednesday's World News Tonight: "The national debate over gun control became even more vicious today. The head of the National Rifle Association accused President Clinton of having quote, 'blood on his hands.'" Gibson referred to NRA Executive Vice President Wayne LaPierre, who declared on ABC on Sunday that President Clinton is "willing to accept a certain level of killing to further his political agenda." As ABC's John Cochran explained, yesterday LaPierre used a specific example: in the death of former college basketball coach Ricky Birdsong, the killer illegally tried to obtain a gun at a gun store, but was not prosecuted, part of a pattern of lax gun law prosecution. Is it fair to blame Clinton? Should political players be blamed for crimes they did not commit? Probably not, but the same outlets insisting LaPierre has crossed a line of incivility have regularly crossed the line or held the door for line-crossers indicting conservatives. Vicious Margaret. In the May 10, 1999 Time, columnist Margaret Carlson gave the mirror image of LaPierre's Sunday statement: "Republicans are betting that this too [Columbine] will pass, that as with Jonesboro and Paducah, Pearl and Springfield, once the white coffins are in the ground and the cameras gone, the outrage will subside. But maybe not this time. In town meetings and talk radio, the public has had its fill of politicians talking resignedly about our gun culture, as if there's nothing to be done about a subgroup that finds schoolyard massacres an acceptable cost for its right to be armed to the teeth." Vicious Katie. On October 13, 1998, NBC's Katie Couric asked Elizabeth Birch of the gay-left Human Rights Campaign: "Do you believe this [Truth in Love] ad campaign launch by some conservative groups really contributed somehow to Matthew Shepard's death?" Birch quickly replied "I do, Katie...this ad campaign has been pumped out all summer presenting gay and lesbian people as defective, as less than, as not fully human." Vicious Richard. When abortionist Barnett Slepian was killed on October 26, 1998, CBS reporter Richard Schlesinger pushed blame on the whole pro-life movement: "Abortion rights activists now believe some leaders of the mainstream anti-abortion movement are inciting supporters on the fringe to violence." Vicious Jane. On the January 3, 1995 Dateline NBC, host Jane Pauley broke for a commercial: "Still ahead, the latest round of violence and bloodshed at abortion clinics. The anti-abortion movement has been creeping to the edge of bloody fanaticism for a decade." Vicious Richard II. In the May 8, 1995 Time, Richard Lacayo found bombers on the radio: "In a nation that has entertained and appalled itself for years with hot talk on the radio and the campaign trail, the inflamed rhetoric of the '90s is suddenly an unindicted co-conspirator in the blast." Vicious Michael. In the May 1, 1995 Time, then-Senior Political Correspondent Michael Kramer blamed the right: "If the perpetrators of the Oklahoma City bombing really view government as the people's enemy, the burden of fostering that delusion is borne not just by the nut cases who preach conspiracy but also to some extent by those who erode faith in our governance in the pursuit of their own ambitions." Before national media stars huff and puff over the pitch of LaPierre's rhetoric, they ought to look in the mirror. Catching up on an illustrative item from back on Super Tuesday, less than thirty minutes after John McCain told Maria Shriver live on MSNBC to "please get out of here," Newsweek's Jonathan Alter provided a liberal's forecast for the Bush-Gore race. His analysis is worth reviewing since it graphically laid out how members of the media perceive the two candidate's and the power of their issues. 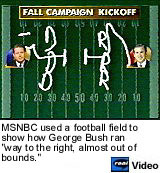 Just like the football commentators, Alter drew lines of motion on a football field graphic, a tele-strator, to illustrate his points, including how Bush "had to run way to the right, almost out of bounds in South Carolina." "I'm gonna play a little John Madden here tonight, maybe not up to the caliber that you see on sports, but we're gonna try to give you a little bit of a sense of how this thing might play out. Now let's just say, you know, you've got the D's over here, with Gore, he didn't have to run that far left because Bradley was over here, so he doesn't have to turn that far toward the center to come up to midfield where these are played out. Bush has a bigger problem. He had to run way to the right, almost out of bounds in South Carolina, and now he has to come back, and you could see him sort of start to do it tonight when he's talking about compassionate conservatism. He's even reaching out to the gay community here. A long journey back to the center there. The first thing he'll battle out on is campaign finance reform, on John McCain's terrain, with Gore's challenge tonight to George W. Bush to reject all of those negative and those independent expenditures." "But if you look at the issues, the game here, the whole game in presidential politics is to play on the other guy's side of the field. So if you say that education and health, maybe, are the Democrats' issues, and over here you've got something like guns and taxes, what you wanna do is play on the other guy's side. So you're gonna have Gore over here trying to engage on guns in pointing out that George W. Bush was in support of a bill that even allows you to take a gun into church. Traditional Republican issue, Gore will try to score on Bush's side of the field. Same thing on taxes. He'll say Bush has offered you a big tax cut. This is what Gore will call a 'risky scheme,' and he'll hope that he can score over here on Bush's side of the field. "Bush, in turn, will go after Gore on education, which has supposedly been a strong Democratic issue, and say that he's the one who's got the record of accomplishment on education, and he'll even try to say that he's had some success on HMO reform in Texas, although that's going to be a tougher sell. But the real battle in the middle of the field is about Bill Clinton. The status quo has some status. You heard George W. Bush talk a lot tonight about whether we want to stick with this status quo that is actually Al Gore's best argument, is the strength of the economy. Bush will try to come in and make the argument that actually we're tired of the Clinton/Gore way of doing things and that even if you like the Clinton era, resistance to him personally is such that we need a change." Life is fun again for Geraldo Rivera. The release of a new book by left-wing journalists Joe Conason and Gene Lyons, The Hunting of the President: The 10 Year Campaign to Destroy Bill and Hillary Clinton, has given Rivera an opening to rant some more about the right-wing conspiracy to destroy the Clintons. MRC analyst Geoffrey Dickens noticed that Wednesday night Rivera asserted: "The book...convincingly proves that there was a right-wing conspiracy." Rivera gloated about how the book proved him correct about the evils of Clinton's enemies and trumpeted how the book features the "stunning story of how much of the mainstream media actually colluded knowingly or through laziness with these fringe wackos." "Remember that day on the Today show. Her allegation largely laughed off two years ago. But two veteran reporters, these guys sitting alongside me here took up Hillary Clinton's challenge to investigate the vast right wing conspiracy. The result of their work this incendiary work of investigative journalism is called, The Hunting of the President. The 10 Year Campaign to Destroy Bill and Hillary Clinton. The book, in my view anyway, convincingly proves that there was a right-wing conspiracy. One of amazing perseverance and cost up to $100 million in public and private funds. A lot of private funds. "From the offers of money to Gennifer Flowers to the false claim that Clinton had fathered a child with a prostitute. From the sleazy Arkansas project funded by the billionaire Richard Mellon Scaife to the secret payments to the President's former bodyguards. It's all in this book. Thickly documented along with the stunning story of how much of the mainstream media actually colluded knowingly or through laziness with these fringe wackos in a desire for scoops. None of which, or not many of which were based on reality. Many based however on false and misleading information. Now I'll be honest as one who investigated part of this material over the last few years it's an 'I told you so,' time for me." What will Geraldo do when Clinton leaves office and he can't spend his life bashing those who dare pursue his heroic President and First Lady?